Clips to anything and is always ready for use, with the most useful array of tools possible within such a small space. 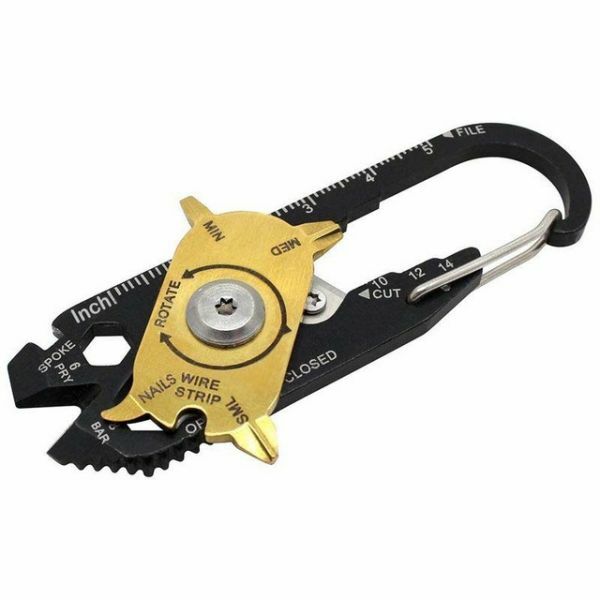 The rotating tool plate serves to protect and keep all the tools safe when the FIXR is not in use, or simply twists with a push of your thumb on its sprung bearings to click definitively into set positions to use the Phillips Driver bits, Nail Cleaner, Eyeglass Screwdriver, razor sharp Cutter and Wire Stripper. It is also includes File, Measure, Box Opener, Pry Bar, and 5 Spanner sizes. Weiterführende Links zu "20-in-1 Taschenwerkzeug Schlüsselanhänger"
Kundenbewertungen für "20-in-1 Taschenwerkzeug Schlüsselanhänger"